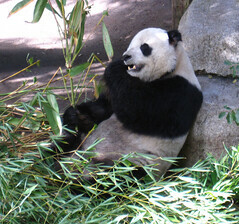 The panda is a large bear that lives in China and eats mostly bamboo. The capybara is the biggest living rodent in the world. Clown fish are fish that are able to swim among certain sea anenome without being stung. 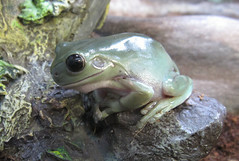 A frog is an amphibian. It is usually carnivorous. 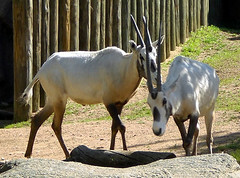 The arabian oryx live in the plains and deserts of the Arabian Peninsula. It is a type of antelope. They weigh around 120 - 150 pounds. Males are larger than females. They eat grasses and plants. 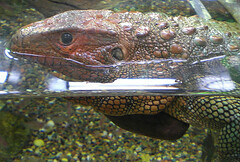 Lungfish breathe with both gills and lungs. Most of the time lungfish breathe using their gills, but they are able to come to the surface and breathe air as well. The ability to breath air with their lungs helps the lungfish survive dry seasons and low water levels. 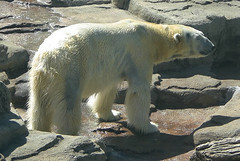 Polar bears live in the north in arctic areas. Polar bears eat mostly seals. Sometimes they also eat walrus, beluga whales, short-legged reindeer, birds, bird eggs, kelp, and beached whales. Polar bears are at the top of the food chain in the arctic. That means no other animals besides humans regularly hunt polar bears. While polar bears are not endangered yet they are a threatened species. Scientists estimate that there are only 20,000 - 25,000 polar bears in the wild (2008). Climate change and the shrinking of the polar bears' habitat are the largest threat. Male polar bears grow to around 2.5 to 3 meters (8 to 10 feet) tall and weigh around 250 to 770 kilograms (550 to 1,700 pounds). Female bears grow to around 1.8 to 2.5 meters (6 to 8 feet) and weigh 90 to 320 kilograms (200 to 700 pounds). Polar bears usually live around 15-18 years in the wild. Some live into their mid 30's especially when raised in captivity. The paddlefish is a primitive fish. It has pointy fins, a scaleless body and a forked tail much like a shark. It has not changed much over 300 million years. There are 2 species of paddlefish today. One lives in North America and the other in the Yangtze River in China. The paddlefish's mouth opens very wide. A freshwater puffer fish that lives in the Congo River in central Africa. The caiman lizard lives in forested floodplains of the Amazon basin. They eat mostly shelled animals such as snails.